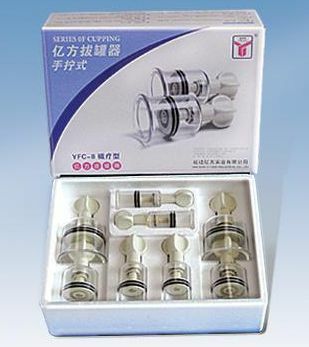 The Twist Top cupping set is designed for easy application and use on the skin. Suction is created by placing the cup on the skin and twisting the knob to create negative pressure inside the cup. 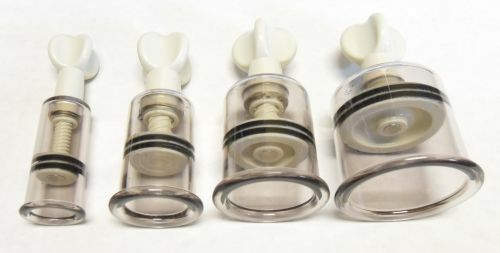 Suction pressure can be adjusted by turning the knob to increase or decrease the suction and the clear plastic allows viewing of the treatment area. 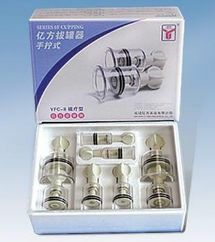 With this set, it eliminates the need to attach and detach the hand pump to each cup on traditional style cupping sets. Each Twist Top cup has a magnetic plunger for a bio-magnetic effect during treatment. This set has 4 cup sizes from 1.9cm to 5cm. If you need larger cups, check out the Rotary cupping set which has sizes up to 7 cm.